These high quality cables are constructed of premium grade, stranded, Enhanced CAT 5 certified cable, and are assembled with RJ45 network plugs and have strain relief boots to further enhance reliability. These crossover cables are ideal for linking two PCs directly together (otherwise known as a "peer to peer" configuration). 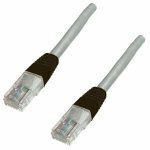 If you need to link a PC to a router, please refer to our range of patch cables.